Of course, most of the times pop-ups are found to be annoying however in this article we are going to talk about some five pop-ups out there that are sure to blow your mind. So, let’s go ahead and talk about them one by one as to how and why they are so amazing. It’s in our nature to get exceptionally appealed by something that has a numbered list. This is something that I think is known to CoversionXL and that it uses numbered lists as the headline technique. Its pop up starts off with numbered list appeal to a great extent as you can see how the number “5” is the largest text on the button. They have a two-color contrast strategy. There isn’t any call-to-action (CTA) that’s colorless and thus stands out. But then, of course they have used limited colors. For instance, they have used a black and grayscale design to make the red button and copy stand out. 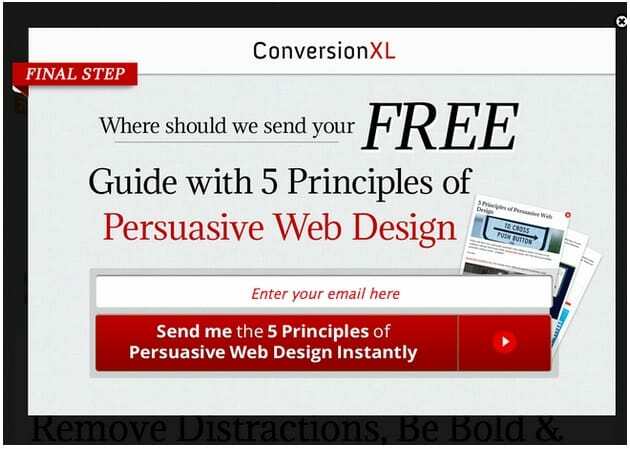 Every single word in the CTA seems to influence either in making conversions or initiating it. There are several words in the pop up such as principles, persuasive, answer, reveal and so on, and almost all these words have a feeling of uniqueness, keenness, and power that makes them conversion ready words. Besides, they have used only 33 words for the entire button that makes each word to count. The button gives people a clear and obvious option to select either yes or no, and wins in stealing the hearts of the users by not complicating things for them. Moreover, it makes things easier for them as well. Although forms happen to be good if you need the prospects information but then it is also a fact that they seem to thwart conversions as bring a kind of adds friction in its process. As you can see users don’t need to fill any form, all they need to do is to click, which is of course a low-risk conversion action. Now, even this interface tries to make it less annoying for the users by telling them that the process is nearly complete with the words ‘final step’. The word ‘free’ can be said a great conversion trigger as that makes it even easier for those who are not willing to convert. Besides, persuasion is kept at full tilt with the use of a variety of design and psychological techniques. Why they are so great? We all are aware with the power of the word free but that sometimes it doesn’t works so effectively as there are a few other factors that matter such as its size, placement, etc. 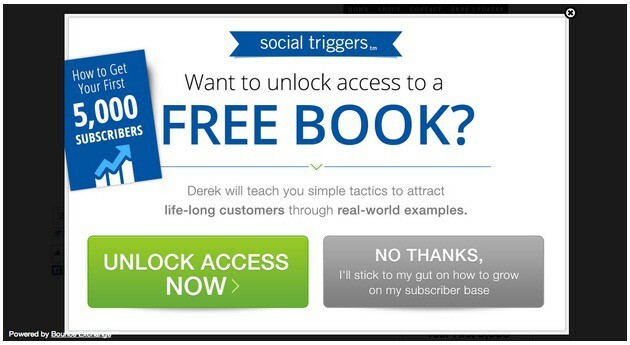 this is what Social Triggers has taken care of by making the words like “free book” and “for free” considerably huge. They even have placed these words at the centre in the pop up making them the first thing one should see. Social Triggers holds the powerful appeal for their target audience that are the users who want to learn , by making use of some very persuasive words for this select group such as “learn” and “teach”. Questions lead to a feeling of curiosity and interest if are compelling. By asking a compelling that has a very obvious answer, Social Triggers makes it easier for users to reach a conclusion their minds and respond to the question. Remember, even a question can be ignored if it isn’t used astutely and has a very obscure answer. A few things that characterize this pop up are cleanliness, smoothness, intuitiveness and obviousness. I mean it’s really simple. Users are bound to convert with a clear eye path and logical flow. Adding a shock-value to your copy helps you get more clicks and garner more attention, especially if it is in the headline. 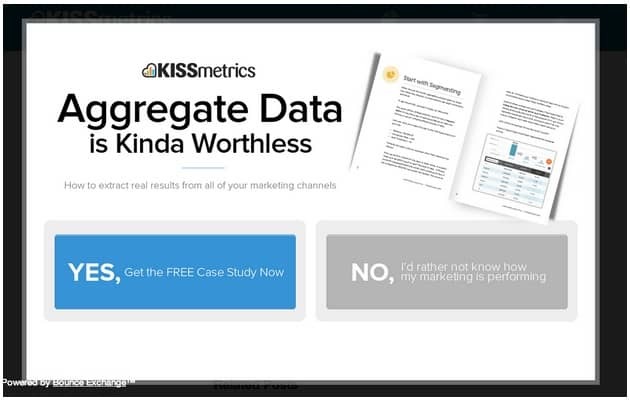 Besides, it also creates a sense of inventiveness by saying “aggregate data is kinda worthless,” as conventionally most marketers rely on aggregate data as the main source of their data. Although, shocking but the statement generates interest among users as to what will come next, and this is actually the attraction of a free case study. 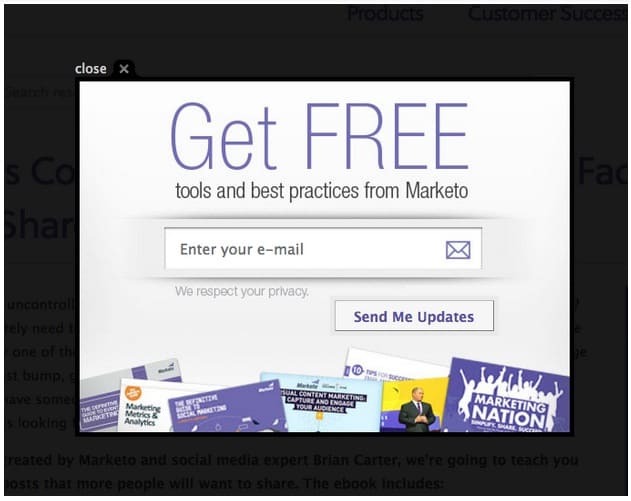 Marketo uses attention distribution strategically that implies a higher conversion as you can see how well the design and conversion elements are placed in the pop up. 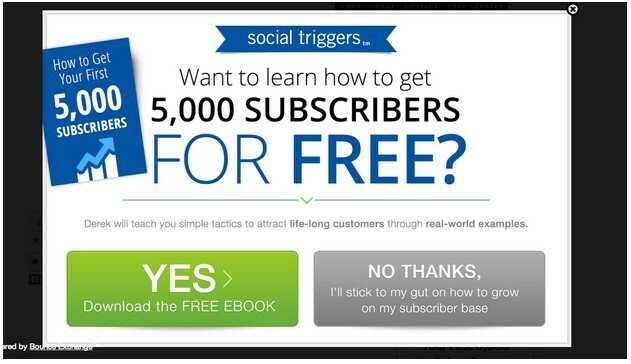 The “get free” headline leading off in a big way, images places at the bottom of the pop up and all other such factors compels the user to focus on the entry form and the submission button. We all know how critical the presence of a trust signal on a website happens to be to conversion success. Marketo knows this fact well and with the help of this little phrase “We respect your privacy,” they are successful in offering a trust signal that may even help the skeptical users to convert. Longer the form, more is the friction and less likely are people to fill it out. This is what Marketo identified with and preferred to ask the most crucial information that was sufficient to serve their purpose and that is the user’s email address. Thus, removal of unnecessary fields made the conversion rates spike up. If you might have heard of neuromarketing, it must be aware with how marketers can generate the need for their product among customers by addressing the pain they are going through and providing a resolution to them at the same time, through this type of marketing. Anyway, this is what AudienceBloom is trying to do to their target market by emphasizing that that “Great links aren’t easy to acquire,” which is one of the biggest issues for any SEO. 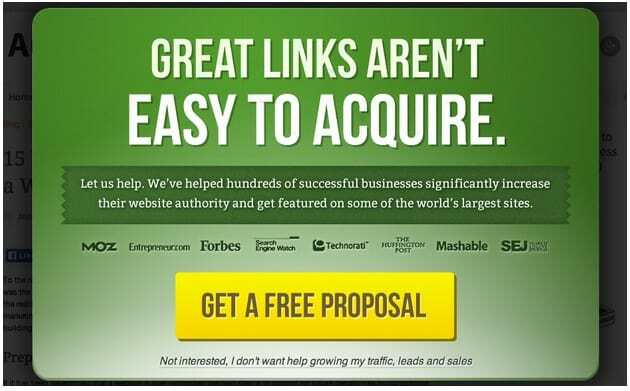 It makes them to think how difficult it is to get valuable backlinks. We already have talked above how trust signals help. AudienceBloom in this pop up is featuring a row of renowned logos (of organizations like Moz, Entrepreneur, Forbes, etc.) underneath their value proposition and that is what acts as the trust signal for them. A number businesses use this technique on their website’s testimonials page. The big and yellow CTA button that they have used cannot be overlooked. Yellow anyway is believed to be a great conversion tool and on top of it, it’s against the green backdrop that acts as the super seasoning. One simply can’t miss it. 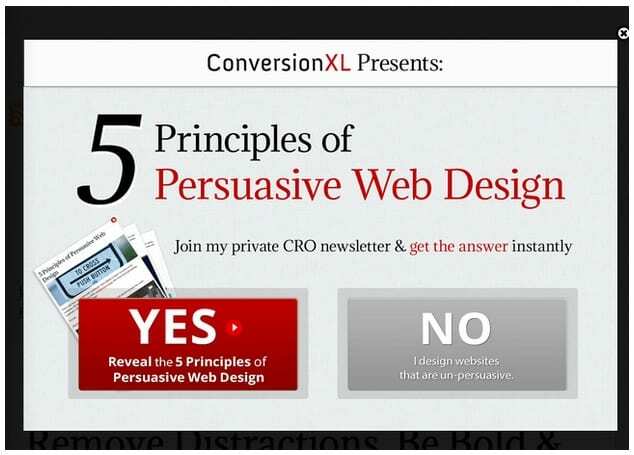 It’s impossible for users to close the pop up without going to the bottom of the page, as they can only do this by clicking on the refusal line i.e.”Not interested.” Now, why does it make harder for users to say no is because it makes the user’s eye path travel right to the button and before user reaches the button they get to see the big, beautiful button right above it, which may improve the likelihood of a conversion. Anyway! If you have seen some features of effective pop ups, do let us know in comments!